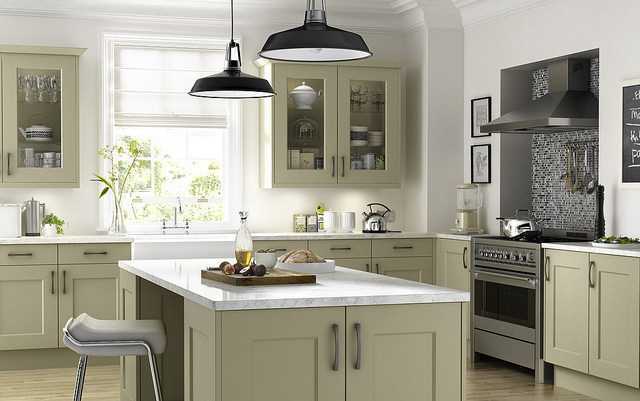 No matter if it takes some small or much bigger space in your home, a kitchen is one of the hardest-working rooms in your house and requires occasionally updating in order to look not so overworked. Here are some tips on how to manage that updates in an easy and not expensive way. 1. The biggest surfaces in your kitchen are the one that gives the strongest reflection of your style and they should be the most appealing. If you refresh those surfaces with some new colors you can expect a completely fresh appearance of entire kitchen space. You can repaint cabinet doors and some of them you can replace with glass doors. There are also many types of stickers and self-adhesive wallpapers which you can use to make a completely different look of your kitchen for a small price. 2. If it’s possible don’t change kitchen layout because it will cost you some money to replace plumbing or electric outlets. Savings on this can help you later with accomplishing some other ideas. 3. Don’t be afraid to point out the contrasts. Take some experiments with different materials or just contrast colors. Leave some surfaces smooth and light colored and add some parts made of rough wood to make a powerful contrast of modern and rustically. You can also play with colors and for example, use black and white in right amounts to give your kitchen a fine, simple design with those two colors which are always modern. 4. If your cabinets are outdated you don’t have to immediately by new ones. Try with open shelves this time. They can increase your storage capacities, and either you make it or buy it, it’s a much cheaper than purchasing whole new kitchen cabinets. Open shelves instead of upper cabinets have some advantage in organizing your dishes, and they give more sense of space and brightness. 5. Play with furniture styles and mix up some of them. For example, if you want a point out your island while your kitchen is mostly in bright colors give isle the dark wood finish. Mix up modern furniture made of steel and glass with some wooden pieces, like wooden chairs but make sure that it’s mutually compatible and that it has a healthy contrast features. 6. Unify a great part of your kitchen with white color. White is the color that stands the test of time and it brings a whole amount of light in your kitchen, and also in every other room. It gives your furniture a healthy glow while represents purity and innocence and make you feel joyful and polite. When the kitchen is mostly white it’s easier to point at some other parts of the furniture that will be in other colors and you can make it very pleasant to the eyes. 7. Improve your kitchen style by being creative with the lighting. It’s important to have much light in your kitchen, especially natural light as much as it’s possible. But you can also put some creativity while choosing pendant lamps or wall lamps. Milky glass can give some stylish note to your kitchen space. If you have recessed lighting or ceiling lamp try to bring in some other friendly colors with under cabinet lights in order to make your working and eating space more alive. 8. Add some more wooden details and pieces into your kitchen, and do it with different types of wood. Use varieties of shades because it will move away that sense of uniformity that goes with furniture based on one style or color. Wood gives you warm feeling while you spend time in the kitchen and it is very grateful for DIY projects of decorating a refreshing your space. 9. Expose some of collectibles and pieces of art that you have in your home. That will give the kitchen some extra touch of your personality and make it look even friendlier to you and your guests. Find a place on some exposed wall at least for a small framed painting with some joyful theme and you won’t miss with that. Your collectibles related to food and dishes can be placed on open shelves or top of your upper cabinets, but you can also point them out on the island and table tops. 10. Update your kitchen appliances or, at least, those which are not very expensive. While choosing them also pay attention to their design, because they can contribute to an overall appearance of the kitchen. You can get a powerful touch with some modern faucet in your sink space. They are not so expensive and come in so many varieties, but especially interesting are those with LED effects for warm and cold water. If you are decided how to refresh your kitchen style, don’t forget to add some flowers to it, no matter which style are you choose. Flowers will bring life, color and scents in kitchen space, and help you to feel better and happier while you around.